Now that winter is over, you’ll be searching for fun outdoor activities to do. If you have kids, you’ll probably consider something that you can do with them. But, what will keep both you AND your kids amused? Kids can be difficult sometimes. They usually only like an activity for a short period of time, and then they get bored. 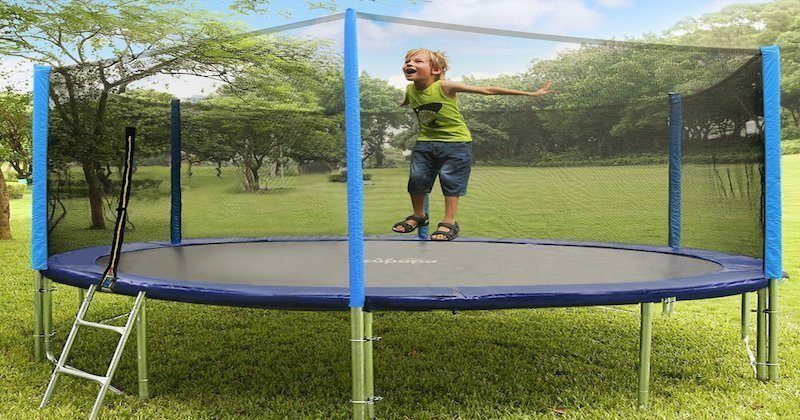 But there is something that will make both you and your kids “jump for joy”, and that’s a Zupapa Trampoline! It doesn’t matter if you’re 5, 10, 25, or even 55, bouncing on a trampoline is one of the most exciting things in the world! If you’re interested in this magnificent bouncing mechanism and would like to hear more about it, keep reading. Zupapa trampoline reviews are here to help you decide whether they’re the right fit for your home. 1 Why Should You Buy a Zupapa Trampoline? Why Should You Buy a Zupapa Trampoline? You want your child to have fun, yet you want it to stay safe. Well, if you’ve decided that you want a trampoline, don’t just go out and buy a generic brand. You need a reliable, sturdy product that your child can safely bounce on. For that reason, Zupapa trampolines are the way to go. Now, the only thing you need to consider is which Zupapa trampoline to buy. Luckily, Zupapa has a variety of home trampolines to choose from. It’s always best to prepare a checklist before choosing any product. The same rule applies when selecting a trampoline. 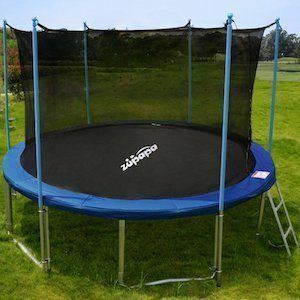 Furthermore, let’s view the different Zupapa trampoline characteristics, features, accessories, as well as the pros and cons. Hopefully, this review will help you make your decision on whether to buy it or not. As you can see from the description the Zupapa trampoline is available in four sizes; 10 feet, 12 feet, 14 feet and 15 feet in diameter. Let’s view all the measurements of the trampoline first. The trampoline is 94 inches high, measuring from the ground to the top of the net enclosure. Also, don’t worry, it’s completely safe, due to the sturdy safety enclosure. Speaking of the enclosure, it is 72 inches high. 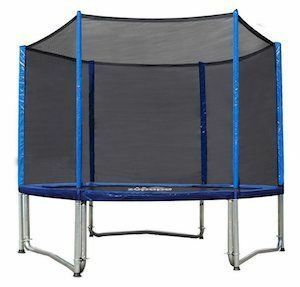 As for the part that will interest the kids the most: the jumping mat is 124.4 inches for the smaller trampoline and 159 inches for the larger one. It completely depends on what size you want. Your kids will be able to bounce around as much as they like. The maximum weight that the Zupapa trampoline can handle is from 330 to 375 pounds. That, of course, means that you can join in on the bouncing too. Once you buy a Zupapa trampoline, you’ll get more than just a trampoline. You’ll get far more than you would get if you bought any other brand. Let’s see what accessories you’ll receive. Additionally, you should note that even with all these accessories, the Zupapa trampoline is still the most budget-friendly option you can purchase! One of the most important things to consider before purchasing a trampoline is how safe it is. Every parent puts the well-being of their child ahead of everything. That’s why the Zupapa trampoline is the best possible choice for you. It was practically designed to fit the needs of cautious parents. 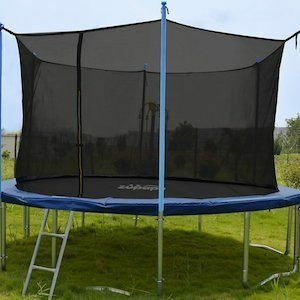 The zippered net enclosure is high enough to keep your kids safe inside the enclosure, without the danger of them bouncing so high that they jump over the net. That way your kids can bounce around as high as they want without you having to check on them constantly . Additionally, the fact that the safety net is that high also allows adults to use the trampoline. Need we say more! Also, the fact that it has all that padding and support makes it next to impossible for any unexpected accidents to occur. Remember the shoe bag accessory? Well, it also serves as a safety precaution. It encourages the kids to take off their shoes (since the bag will keep any pets from running off with the shoes) which in turn prevents injuries. The ladder will ensure safe climbing on and off of the trampoline, so no homemade step-ladders are necessary. Let’s not forget the trampoline cover. It helps keep the material strong by keeping off debris, twigs, pebbles. So, no unexpected tears. Sturdy structure: The Zupapa trampoline is made of materials that make it sturdy and reliable. Both the frame and the springs are constructed from heavy-duty steel. Moreover, the steel is galvanized, which means it’s much stronger than regular steel. Not to mention-it’s rust and corrosion resistant. Needless to say, the springs are usually the first to fall victim to rust, but since they are made from galvanized steel, they are also rust resistant. The mat is heavy duty and made of UV resistant material, so it won’t weaken from sun damage. Safety: Zupapa Trampolines are among the safest trampolines in the world. The trampoline has thick foam padding as well as thinner foam padding that covers the springs. So, no chance of scratches and bruises caused by landing on hard metal springs. The net is high enough to provide a safe enclosure that your kids won’t be able to jump out of. Not even by bouncing extra high. Easy assembly: You would think that assembling such a heavy-duty trampoline would take days. But it doesn’t. Actually, some of the parts come pre-assembled. It takes about two hours to put together. After that, you’re free to bounce around as much as you’d like! Extra bounce: The Zupapa trampoline has a UV resistant mat that has “super stretch” which makes it possible to bounce extra high. The safety net zipper: Although there really aren’t many cons to put on the list, the only thing that could constitute an inconvenience is the safety zipper on the net. It tends to get stuck. Additionally, it doesn’t slide up and down as smoothly as it should. According to the Zupapa trampoline reviews, this model is well worth the money. 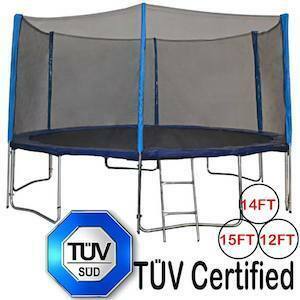 Also, it’s important to say that all Zupapa trampolines come with TUV certification. This trampoline checks off all the essential features you should look for when purchasing a trampoline. It has great safety features, a sturdy construction, it’s easy to assemble, it comes with additional accessories, and it’s extra bouncy. Not only will this trampoline bring a big smile to any child’s face, but it will also help them remain active and therefore healthy. It’s a great way to get them out of the house and into the fresh air. It’s a trampoline built for the whole family. Your kids will enjoy it, and you will enjoy it. Teach your kids how to have fun outdoors without any electronic gadgets. Try out the Zupapa trampoline.